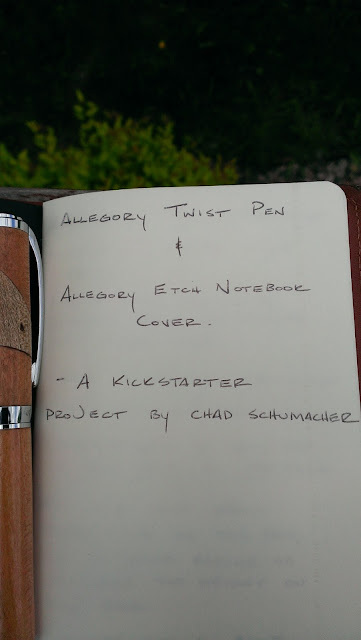 There seems to be a strong Renaissance of sorts for handcrafted goods these days, and one of the projects on Kickstarter right now includes the Twist Ballpoint Pen and the Etch Notebook Cover, two new products from Allegory. 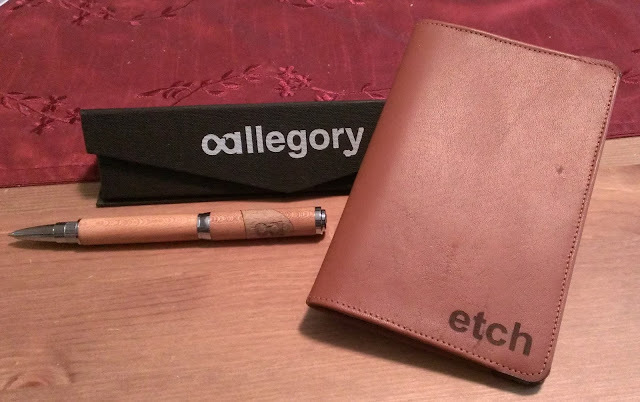 The pen comes in to flip-top magnetic case, and the Etch (yes, I know it's lowercase, but I'm trying to make this easier to read) comes with a 3-Pack of Moleskine Cahier notebooks, but there's also an option to order Field Notes if you prefer. Though I don't have a small scale, I can tell you that this pen is very heavy, as in the heaviest pen I own. 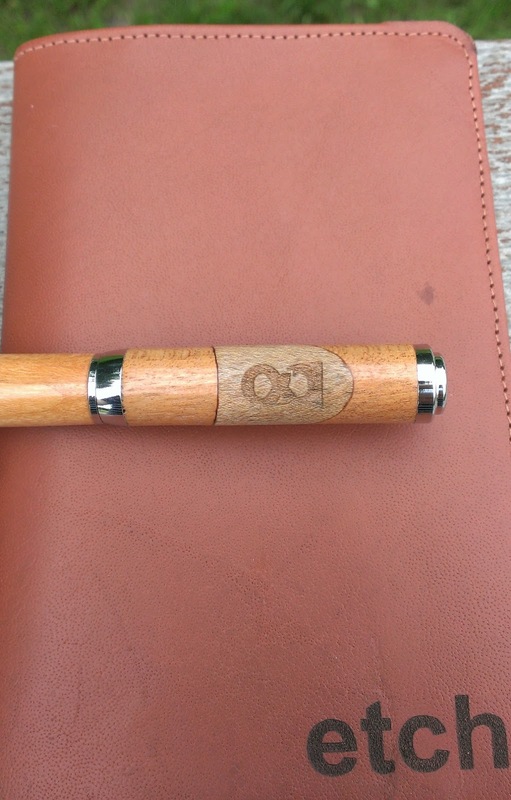 But you can see that it's a very cool pen, assuming you like wood as a pen material, and it contrasts nicely with the chrome hardware. Regarding the configuration of the pen, you can select the color scheme of the pen (light or dark) and the refill that you like best. As you can see, I really enjoy the way this pen writes, and I will be looking to see if I can find a nice, fine point refill to replace the 1.0 ballpoint inside - perhaps I will go with a rollerball refill instead. This is by no means a cheap date, but this is a pen that will last many years, if not a lifetime. Kangaroo leather is very high in tensile strength, which means we can offer a slim design that is also very durable. It also has a world class texture and feel: soft, conforming, and it develops a beautiful patina very quickly. Perhaps most importantly, kangaroo is arguably the most ethically harvested leather in the world. It is a byproduct of the kangaroo meat industry, which is not farm/ranch-based. The animals live full lives in their natural habits and are harvested humanely to prevent overpopulation and protect the local ecosystem. As with all our materials, we have researched the ethics and environmental concerns thoughtfully. You can find more info on this in the FAQ. My experience with the notebook cover is very favorable: it's a great design, the leather is soft, and the whole package appears to be quite durable. It looks great and the functionality is evident. I did notice two imperfections in the leather: one was just below the letter 't' and the other is a small blotch 60% up on the center-right side of the notebook. I don't know if this is typical or if I received a flawed sample, but I really couldn't care less - my Doane Utility Notebook cover has some scars, but it shows that it gets used, and I enjoy that aesthetic consequence. Outside of that, the back, outside cover has two slots for cards, notes, or your identification. I did forget to take a picture of this, but you can see it on the Kickstarter project page. In summary, these are examples of two, well-made, responsibly-sourced products, made by hand, and crowd funded to help a small, domestic business get its name out there. For me, it doesn't get much better than that. I would make changes to the weight distribution in the pen, and I would prefer additional options for refills, but a smooth writing ballpoint makes most people happy, so it's not a bad way to go in terms of building the company. 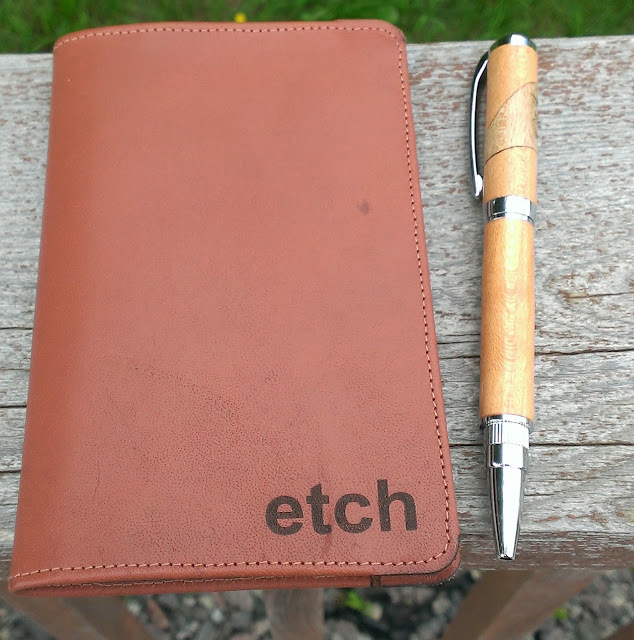 Both items can (ideally) be obtained with a $40 pledge ('etch notebook cover) and $60 (Twist ballpoint), or $100 (both). I'd be glad to try more products from Allegory any day. Congratulations to awordsmith; you are the lucky winner of the W.A. Stark .30 Cal Bolt Action Ballpoint Pen. 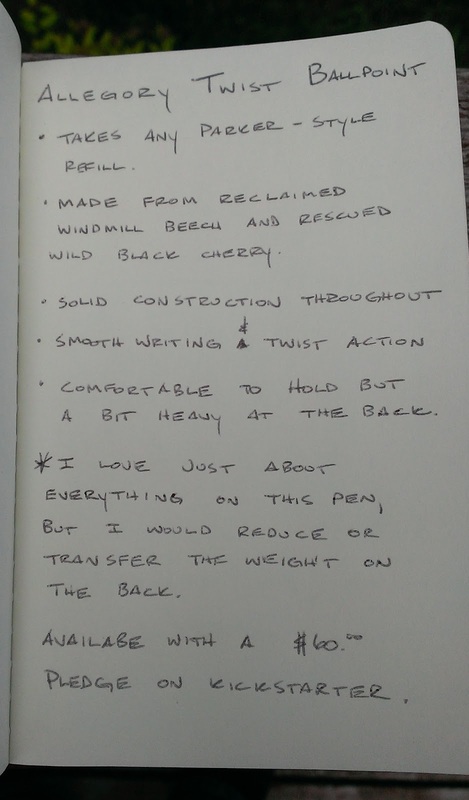 Though the rest of you may not have won, you've provided important feedback to help a new business in the pen/paper/ink community, so I certainly appreciate it, and I'm sure it was helpful for W.A. Stark, too. awordsmith - you will have one week to e-mail me your mailing information, or a new winner will be selected and posted.